While the world marvels at the first black hole image ever taken, a Chinese photo-sharing community is setting off a huge public outcry over its use of the landmark photo and a wider debate over copyrights practices in China. As soon as the European Southern Observatory released the black hole photo on April 10, Visual China Group (VCG), China’s leading stock image provider that’s compared to Getty Images and owns Flikr’s one-time rival 500px, made the image available for sale in its library without attribution to the Event Horizon Telescope Collaboration (EHT), an array of radio telescopes that captured the image of the black hole. “This is an editorial image. Please call 400-818-2525 or consult our customer service representative for commercial use,” said a note for the black hole image on VCG’s website. Unless specifically noted, the images, videos, and music distributed on the public ESO website, along with the texts of press releases, announcements, pictures of the week, blog posts and captions, are licensed under a Creative Commons Attribution 4.0 International License, and may on a non-exclusive basis be reproduced without fee provided the credit is clear and visible. VCG swiftly revised the note to say the black hole photo should not be used for commercial purposes, but Pandora’s box was already open. The incident sparked a plethora of comments on Weibo, China’s equivalent of Twitter, condemning VCG’s opportunist business practice. The site is said to often play the role of the victim to obtain financial compensation, and it does so by seeking damages from users who inadvertently use a public domain photo that VCG has preemptively copyrighted. Shares of VCG plummeted 10 percent Friday morning in Shanghai, giving it a market cap of 17.66 billion yuan ($2.63 billion). Assets of VCG’s massive content library range from logos of large tech companies like Baidu, all the way to the Chinese national flag. “Does your company also own copyrights to the national flag and national emblem?” remarked the Chinese Communist Youth League on its official Weibo account in a snarky response to VCG’s unscrupulous licensing practice. 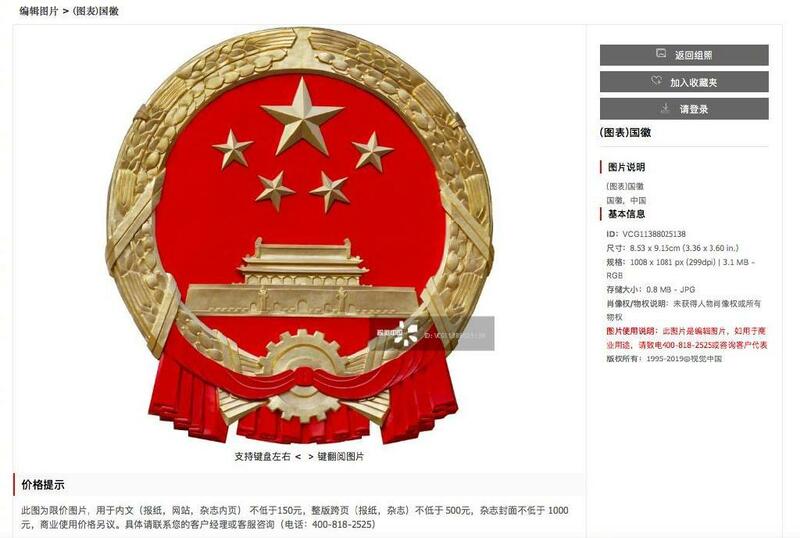 The price tag of the national emblem image is, lo and behold, no less than 150 yuan ($22) for use in a newspaper article and at least 1,500 yuan ($220) on a magazine cover. “Copyrights protection should definitely be promoted. The question is, why is VCG allowed to price photos of the black hole and the likes out of the market? Why is it able to exploit loopholes?,” Du Yu, a Beijing-based freelance technology journalist, said to TechCrunch. TechCrunch has reached out to ESO for comments and will update the story once we hear back. VCG apologized on April 12 in a company statement, admitting the lack of oversight over its contracted contributors who allegedly uploaded the images in question. “We have taken down all non-compliant photos and closed down the site voluntarily for a revamp in accordance with related laws,” said VCG.